March 8, 2019, Birmingham, AL. Sophomore Rachel Baxter earned 1st team All-American honors with her second highest ever indoor mark or 4.41m while Senior Deakin Volz earned second team honors with a jump of 5.53m. Feb 22, 2019, Blacksburg, VA. Senior Deakin Volz succesfully defended his ACC indoor title and sophomore Rachel Baxter set a school record 14' 8" to claim her first ACC title. Find out more by following the recent meets link. June 15, 2018, Bloomington, IN. Freshman Rachel Baxter set a personal best 14'6" to win her third consecutive US Junior title! Five VT Vaulters Score at NCAA Nationals..
June 6-9, 2018, Euguene, OR. All five VT Vaulters finshed in the top eight to score at the NCAA outdoor championships and also earn first-team All-American honors. Bronze medals by Torben Laidig and Lisa Gunnarsson led the effort. Vaulters capture four medal spots at ACC outdoor championships. May 10th and 11th, 2018, Miami, FL. The Hokie vaulters picked up four medals and 35.5 points in an exciting competition at this year's ACC outdoor championships. Lisa Gunnarsson Sets Outdoor School Record!!! March 31st, 2018, Austin, TX. Freshman Lisa Gunnarsson tied, and then twice broke the Virginia Tech outdoor school record. The record was 4.50m held by Martina Schultze. Lisa had clears at 4.50m, 4.55m, and 4.60m to finish second at the event behind only Olympian Jen Suhr. March 9th 2018, College Station, TX. Four Hokie vaulters earned All-American honors this weekend at the NCAA indoor championships. First team honors were earned by Deakin Volz (3rd) and Lisa Gunnarsson (4th) while Torben Laidig and Rachel Baxter earned second team honors. Lisa Gunnarsson Sets Indoor School Record!!! January 26th, 2018, Bloomington, IN. Freshman Lisa Gunnarsson set a new school record of 4.46m, in winning the Bob Pollock Invitational. Torben Laidig Sets Indoor School and ACC Record!!! April 1, 2017, Austin, TX. Junior Torben Laidig opening the outdoor season with a bang as he set a new school and ACC record of 5.70m, 18'8.25" in winning the college section of the Texas Relays. Deakin Volz Sets Indoor School and ACC Record!!! Feb 18, 2017, Blacksburg, VA. In an meet that saw him set two more indoor PRs, Deakin ended the meet with a new lifetime best, indoor school record, and indoor ACC record of 18' 6.75" (5.66m). As of this time Iit is the #2 jump in the NCAA. Deakin Volz Wins IAAF U20 World Championships!!! July 23, 2016, Bydgoszcz, Poland. In an exciting battle with world U20 leader Kurtis Marschall of Austrailia, Rising VT Sophomore Deakin Volz set three personal bests and a school record to win the IAAF U20 World Championships. It is the first time that an American vaulter has won the event in its 20 year history. More details can be found by following the recent meets link. June 8th, 2016, Eugene, Oregon. Historic Hayward field was again the venue for this year's NCAA championhips and four Hokie vaulters made it to finals with two ending up as All-Americans. Sophomore Torben Laidig grabbed the silver medal spot to earn first team All-American honors which Junior Brad Johnson earned second team honors with a 12th place finish. Read all the details by following the recent meets link. May 13th, 2016, Tallahasse, FL. Senior Chris Uhle led a super-sweep of the men's pole vault at the ACC championships to earn 38 points to help propel the men's team to an ACC championship. Meanwhile, 4 VT women vaulters also score! All the details can be found by folloiwing the recent meets link. April 2nd, 2016, Austin, TX. Sophomore Torben Laidig got off to great start to the outdoor season by raising the school record to 5.60m (18' 4.5") while competing at the Texas Relays. The previous record of 5.53m was held by Brian Mondschein and was set in Clemson. S.C. in 2006. Deakin Volz Earns Bronze Medal at NCAA Championships!! Seven Hokie Vaulters score at ACC Meet! February 27, 2016, Boston, MA. It wasn't a perfrect meet but overall the team was solid and made a huge contribution to the team at the ACC indoor championships with 7 vaulters scoring a total of 26.5 points. February 6, 2016, Blacksburg, VA. Sophomore Torben Laidig raised the VT school and all time ACC indoor record in the vault for the second week in a row with an impressive jump of 5.62 meters (18' 5.25") this weekend at the Doc Hale Invitational. Solid jumping by the rest of the crew including PRs by James of 17' 0.75" and Jeff 16' 5" also propelled the guys to new double, triple, and quad combination records. January 29th, 2016, State College, PA. Sophomore Torben Laidig set two personal best on the way to raising the VT indoor school record to 5.56 meters (18' 2.75") this weekend at Penn State National Invitational. The previous record had been set by Jenia Olhovsky in 2009 at 5.55 meters. Torben currently sits in the top spot on the NCAA descending order list. Brad Johnson wins ACC outdoor Championships in 1,3,4 Sophomore Surge! May 16, 2015, Tallahassee, Fl. With two teammates sidelined with injuries, sophomore vaulter Brad Johnson dug deep and led a sophmore surge to a 1, 3 ,4 finish at the outdoor ACC championships. 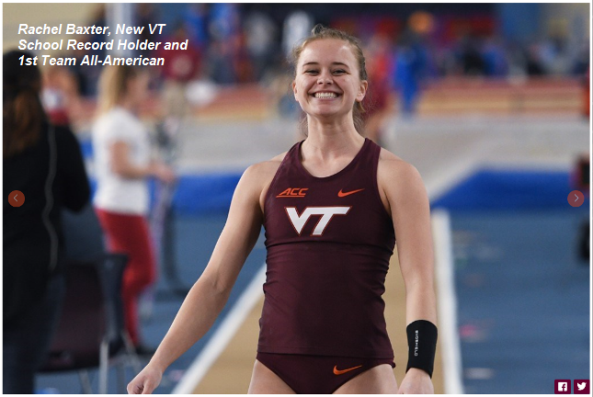 Between men and women, indoor and outdoor, It was the 28th time a Hokie vaulter has won an ACC vault title since joining the conference in 2005. All the details can be found by following the recent meets link. Chris Uhle Breaks ACC Meet Record! February 28th, 2014, Blacksburg, Va. Senior vaulter Chris Uhle set the ACC Chamipionship record with a jump of 18' 1.25" to win the indoor ACC pole vault title. It was a huge day for the VT vaulters and the VT track and field team which won the overall championship. All the details can be found by following the recent meets link. Chris Uhle Breaks 18' Barrier! January 24th, 2014, Blacksburg, Va. Senior vaulter Chris Uhle set two personal bests: 17' 11.25" and then 18' 1.25" to move to a tie for third on the VT All-time list. The vault currently places Chris at #5 in the NCAA. Three Hokies Qualify for NCAA Championships! May 30th and 31st, 2014. Jacksonville, FL. Seven Hokie vaulters competed at the NCAA East Region Premliminary Round with three advancing to the finals in Euguene, Oregon. Martina Schultze, Stephan Munz, and Torben Laidig all advanced. All the details can be found by following the recent meets link. Munz and Schultze Win ACC Championships! April 18th and 19th, 2014. Chapel Hill, NC. Redshirt junior Martina Schultze and redshirt senior Stephan Munz both claimed ACC vault titles this weekend at the outdoor championships. It was a another excellent effort by the whole crew which also included a silver medal performance by freshman Torben Laidig and 4th place finishes by redshirt freshman Jared Allison and junior Chirs Uhle. All the details can be found by following the recent meets link. March 15th, 2014. Albuquerque, NM. Junior Martina Schultze and freshman Torgen Laidig both earned first-team All-Amercican honors this past weekend by placing in the top eight at the NCAA National Championships. Details can be found by following the recent meets link. Laidig and Schultze Win ACC Championships! March 1st, 2014. Clemson, SC. redshirt junior Martina Schultze and true freshman Torgen Laidig both claimed ACC vault titles this weekend. It was a spectacular effort by the whole crew which also included a silver medal performance by Junor Chris Uhle. All the details can be found by following the recent meets link. Nine Hokie Alumni and two guests braved injury and embarassment in this year's alumni vault. Morgan Allen (Hokie swimming alumni) filled in for Joe Davis who was coaching for Clemson University up at the Armory in New York. But a quick lesson and a couple of warm jumps weren't enough to get her ready for the opening bar so she retired as a vaulter after warmups. Our other guest was Mario Wilson who now coaches for the University of Virginia who was basically goaded into staying and jumping. Sean Wilburn, the vault coach for Duke was seriously tempted but swore his wife would kill him if he got hurt so declined. That was probably the smart move as their was serious limping going on by the end of the meet for several alumni including Bob and Mike who had to withdrawal. The usual rules were in place: (1) vaulters are awarded one inch for every year over the age of 25 (2) women are awared a 42 inch adjustment (3) an additional inch is awared for every year that someone has gone without vaulting. After all of the adjustments were made, 5 time All-American Hunter Hall was declared the victor. Coach Phillips doesn't like no-heights so next year everyone will be required to clear the opening height, then they can pass to something their mind thinks they can clear even though their body knows damn well ain't happening. Martina Raises Outdoor School Record! July 25th. Besigheim, Germany. Rising Junior Martina Schultze raised the outdoor school record for a 5th time this year with a new personal best jump of 14' 9.25". Personal Best x2 for Chris Uhle! July 13th. Winston-Salem, N.C>. Rising Junior Chris Uhle set two new pesonal bests with jumps of 17' 4.5" and 17' 8.5" to win the first ever street vault in Winston-Salem, N.C. He then had two good attempts at 18' 1.5". We don't count street and beach vaults for record keeping purposes but it was none-the-less an outstanding performance. The event was a lot of fun with lots of spectators crowding in for a look at the sport. July 10th. Kazan, Russia. Rising Junior Martina Schultze finshed second at the World University Games with a new outdoor school record jump of 14' 5.25". Uhle and Schultze Earn All-American Honors! June 6th and 7th, 2013. Eugene, OR. Sophomore vaulters Martina Schultze and Chris Uhle both earned All-American honors at the NCAA Outdoor Championships. Details on the competition can be found by following the recent meets link. Uhle and Schultze Advance to NCAA Finals! May 24, 2013. Greensboro, NC. Sophomore vaulters Martina Schultze and Chris Uhle have advanced from the East Preliminary round to the NCAA finals to be held in Eugene, Oregon beginning June 5th. The preliminary round was contested until only twelve of the forty-eight East Region qualifiers remained. Both Chris and Martina recorded only first attempt clears up through the qualifying height. Other details on the competition can be found by following the recent meets link. Schultze Breaks Outdoor School Record... Again... Again! May 9, 2013. Blacksburg, VA. In a repeat of the last couple weeks sophomore Martina Schultze opened the meet by clearing 13'6" and then rasied the bar to a school record (this time 4.37m) and also cleared. She then attempted 14'8.5". Other details on the meet can be found by following the recent meets link. Schultze Breaks Outdoor School Record... Again! May 1, 2013. Lynchburg, VA. In a repeat of last week sophomore Martina Schultze opened the meet with a first attempt clear at 4.13m and then rasied the bar to a school record (this time 4.35m) and also cleared on her first attempt. She then had two outstanding attempts at 4.48m. Other details on the meet can be found by following the recent meets link. Schultze Breaks Outdoor School Record! April 26th, 2013. Radford, VA. After a first attempt clear at an opening bar of 4.13m, Sophomore Martina Schultze rasied the bar to 4.33m and also cleared it on her first attempt to raise her own outdoor school record. She then had one very close attempt at 4.46m. Other details on the meet can be found by following the recent meets link. April 19th and 20th, 2013. Raleigh, NC. Sophomore Martina Schultze repeated as ACC outdoor champion while sophmore Chris Uhle earned a silver medal at this weekend's ACC outdoor track and field championhips. Between men and women and indoor and outdoor championships, VT vaulters have now earned 22 gold, 13 silver, and 11 bronze medals in the pole vault since joining the conference 8 years ago. 2013 Summer Pole Vault Camp! The New 2013 River Valley Pole Vault Camp will be held July 8th to July 13th, 2013. For more information please see the camp brochure/registration form and the tentative camp schedule. Camp will be limited to 24 vaulters so please send in your registration form as soon as possible and also email me at bob.phillips@vt.edu to reserve your spot. Looking forward to seeing you at camp! AS OF MAY 1 CAMP IS FULL. Martina Schultze Takes Bronze Medal at NCAA Championships! March 8, 2013. Fayetteville, Arkansas. Sophomore Martina Schultze recorded a first attempt clear at 4.40m (14' 5.25") to earn the bronze medal at the NCAA Championships. It is the highest finish yet by a VT female at the championships in the pole vault. Stephan Munz and Martina Schultze win ACC Titles! Martina Schultze Breaks Indoor School Record! February 9th, 2013. Blacksburg, VA. Virginia Tech sophomore Martina Schultze set a new school record of 14' 4.5" (4.38m) on her first attempt at this past weekend's Doc Hale VT Elite Meet. The jump currently sits at the number 3 spot in the country. Weekend results for all the Hokie vaulters can be found by following the recent meets link. Joe Davis, Hunter Hall, and Martina Schultze all earnned All-American honors this past weekend at the NCAA National Championships. Joe had the highest finish with a new personal best of 5.40m earning him 1st Team All-American honors. Hunter and Martina were selected to the second team. The VT men finished 5th as a team. It is the second year in a row they have finished in that position at the championships. Three Hokie Vaulters Advance to NCAA Finals! April 26th, 2012. Jacksonville, FL. The top forty eight male vaulters and top forty-eight female vaulters from the eastern half of the United States competed at the University of North Florida this past weekend for twelve coveted spots for the NCAA finals. Seniors Hunter Hall and Joe Davis along with Freshman Martina Schultze successfully advanced. The finals will be held at the NCAA National Championships to be held in Des Moines, Iowa, June 6th to the 9th. The New River Valley Pole Vault Camp will be held July 9th to July 14th, 2012. For more information please see the camp registration form and the tentative camp schedule. Camp will be limited to 24 vaulters so please send in your registration form as soon as possible and also email me at bob.phillips@vt.edu to reserve your spot. Hokie Vaulters Claim Five ACC Medals, Sweep Men's vault, Break Women's School Record! April 20th, 2012. Charlottesville, VA. The Virginia Tech vaulters faught through a couple of rough starts to claim two gold, two silver, and one bronze medal in the 2012 Outdoor ACC Track and Field Championships. The VT men swept the medal positions (seniors Hunter Hall, Joe Davis, and Mike Miller) and also scored points at the 7th position (Freshman Chris Uhle) to help the men's team to their first ever outdoor ACC team championship. On the women's side freshman Martina Schultze and Victoria von Eynatten earned Gold and Silver with Schultze raising her own school record to 4.30m (14' 1.25"). More details can be found by following the recent meets link. Martina Schultze Breaks School Record! March 31st, 2012. Austin, TX. In her second outdoor meet, Virginia Tech freshman Martina Schultze set a new school record of 13' 11.25" (4.25m). It was nearly raised again a few minutes later as the freshman just grazed a 14' 3.25" attempt on the way down. Pictures and videos should be posted in a day or two. Weekend results for all the Hokie vaulters can be found by following the recent meets link. March 2012, Boise, Idaho. Freshman Victoria von Eynatten and Martina Schultze earned All-American honors at the NCAA indoor championships. A meet summary can be found by clicking on the recent meets link. February 24th, 2012. Boston, MA. The women's vault squad swept the medal spots at the ACC Indoor Track and Field Championships on Friday night. Freshman Victoria von Eynatten (1st), freshman Martina Schultze (2nd), and sophomore Kristen Brown (3rd) combined for 24 points with some outstanding jumps. Complete results can be found on the recent meets link. February 18th, 2012. Blacksburg, VA. Freshman Victoria von Eynatten set a new school record of 14' 4" (4.37m) on her first attempt at the height breaking the record she set just two weeks ago. She then had an outstanding attempt at 14' 6.75" (4.44m) just grazing the bar on the way down. The performance currently sits tied for the #3 mark in the NCAA. Freshman Teammate Martina Schultze put up the number 10 jump in the country with an indoor best 4.23m. Weekend results for all the Hokie vaulters can be found by following the recent meets link. The second annual VT alumni vault was held February 17th and saw seven alumni and one guest vaulter jumping. Although all were hurting the next day, none were hurt so it was a sucessful meet. Men and women competed in one section in front of a spirited crowd of primarily VT and W&M vaulters and parents who were out for (and received) a good laugh. The rules from last year were adapted with two amendments. 1) Vaulters would receive a 1" credit for every year that had passed since they last vaulted. This rule was proposed by Nate who hadn't vaulted since he graduated 10 years ago and was adopted. 2) Even though we were jumping indoors it was decided that a wind rule would be needed for vaults where there was an obvious clear followed by the pole knocking the bar off. That rule change was also adopted and was invoked twice during the meet when sudden unexplained guests of wind blew the pole into the bar. The remaining rules from last year were a 1" credit for every year over the age of 25 and a 42" credit for the gals. Like last year, the event was a lot of fun with tentative plans to have the event next year the same weekend (Friday night after the unseeded sections of the vault in the VT Challege). Mark your calendars! Victoria von Eynatten Breaks School Record! February 4th, 2012. Blacksburg, VA. In her first meet representing Virginia Tech, freshman Victoria von Eynatten set a new school record of 14' 2.5" (4.33m) on her second attempt at the height. It was nearly raised again a few minutes later as the freshman just grazed a 14' 4.5" attempt on the way down. The performance currently sits as the #5 mark in the NCAA. Weekend results for all the Hokie vaulters can be found by following the recent meets link. Joe Davis Records National Mark! January 21st, 2012. Blacksburg, VA. After struggling early in the meet, All-American senior Joe Davis fought his way back to set a new personal best mark of 17' 7". The performance currently sits as the #7 mark in the country and is Joe's opening salvo in his bid to qualify for the NCAA National Championships. Weekend results for all the Hokie vaulters can be found by following the recent meets link. August 25, 2011. I am happy to announce a new pole vault club: NRV Vault . The new club will provide an opportunity for local youth, age 16 to 19, to learn, practice, and compete in the pole vault. For more information click on the announcement on the bottom of the left menu or the link in this news flash. Joe Davis earns All-American honors at the NCAA Championships! June 8, 2011. Des Moines, Iowa. After an uneasy start to the NCAA Championships, VT junior Joe Davis unleashed a first attempt clear at an outdoor PR of 17' 2.5" to finish 8th and earn his first NCAA All-American honor. He scored one point for the Hokies who finished 5th at the meet behind Texas A&M, Florida State, Florida, and LSU. It was the team's highest ever NCAA finish. Jared, Joe, and Hunter all qualify to the National Championships! May 27, 2011. All three VT men qualified through to the NCAA National Championships. Each jumped 5.20m (17'1") where the meet then stopped. The twelve east region Qualifiers will join twelve west region qualifiers to compete in the final round in two weeks at Drake University in Iowa. Jared Jodon wins Penn Relays! April 30, 2011. Pennsylvania native and senior Hokie Jared Jodon won the championship pole vault section of the historic Penn Relays on Saturday at Franklin Field. He was the lone Hokie vaulter at the meet and improved on his 5th place showing from last year. Meanwhile, Hokies were medaling at two other meets, the Highlander invitational in Radford, Virginia and the Steve Scott Classic in Irvine, California. See the recent meets link for details. Senior pole vaulter Jared Jodon wins ACC Title! April 23, 2011. In his final conference championship, Jared Jodon won the ACC pole vault title at the 2011 Outdoor ACC championships held at Duke University. The senior would not be denied his fourth ACC medal and his first ACC title, clearing every height on his first attempt until exiting the competition with three attempts at 18' 0.5". Junior Joe Davis took the Silver Medal. More details can be found by follwoing the recent meets link. Olhovsky, Hall, and Phillips earn All-American Honors! Marrch 14, 2011. The NCAA has named VT senior vaulters Hunter Hall and Jenia Olhovsky as First Team All-Americans for their performances at the 2011 indoor national championships. It was Jenia's 7th and Hunter's 3rd such honor. Senior Kelly Phillips was named a second team All-American for her performance. It was second All-American honor. Kelly Phillips Receives Elite-88 Award! March 11th, 2011. Senior Kelly Phillips has been reconized as the best female student in NCAA Division I Track and Field. She received the honor at an awards banquet on Thursday night while attending the NCAA Indoor National Championships in College Station, Texas. The NCAA gives this award to one athlete at each of the 88 sports championships that it sponsors each year. March 11th, 2011. VT Pole Vault Coach Bob Phillips was named the NCAA Southeast Region Men's assistant coach of the year by the NCAA Track and Field and Cross Country Coaches Association for his success this seaon coaching the vault. Kristen Brown Qualifies for U.S. Junior Nationals! March 5, 2011. Freshman Kristen Brown qualified for the U.S. Junior National Meet in Eugene, Oregon this coming June by clearing a personal best 3.90m (12' 9.5"). It was Kristen's 7th PR of the year in the pole vault. Phillips and Munz Claim Vault Titles! Feb 26, 2011. VT Vaulters Kelly Phillips and Stephan Munz took ACC vault titles this weekend to cap another strong performance by the squad. Six VT vaulters scored conference points racking up 36.5 points. See the recent meets link for more details. Olhovsky and Hall put up National Marks! Feb 19, 2011. Jenia Olhovsky cleared 5.47 meters (17' 11.25") to move into the number three spot nationally while Hunter Hall jumped 5.37 meters (17' 7.35") to grab a share of the number eight spot. Joe Davis also sits in the top 20 nationally. 1) Each competitor would receive a one inch credit for every year over the age of 25. 3) Abbey would receive a 3" credit because she had a hurt finger and she insisted. The event was a lot of fun as was the trip to Macado's after so everyone is looking forward to continuing the tradition next year. Kelly Phillips Sets School Record!